HELLO KITTY LOGO AS SHOWN. compatible with CD players, mp3/mp4 players, and other portable audio/video devices. 100% AUTHENTIC. The Beats Solo Wireless has a dynamic and wide range of sound with a natural clarity. The earcup padding buffers outside noise, bringing you closer to what the artist intended you to hear. Regardless of what kind of music you’re into, you'll feel the crisp, balanced sound in your Solo Wireless. Hello Kitty iHome Bluetooth W/bonus HK Earbuds. Condition is New. Shipped with USPS Priority Mail. 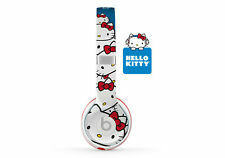 Hello Kitty HK-12309WHT-FR Earbuds with In-Line Microphone and Case. 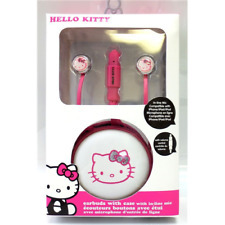 Hello Kitty HK-12309WHT-FR Earbuds Features What's in the box: Hello Kitty HK-12309WHT-FR Earbuds, Case. Packaging opened only to verify product integrity. Otherwise unused. Great item for the Hello Kitty Collector. Cool character styling. Power and charging LED indicator. Charging cable included. Powerful 4 Amplified Speaker. Bluetooth Wireless Speaker System. Hello Kitty. Enjoy wireless audio from any Bluetooth enabled device such as iPad/iPhone/iPad touch, Samsung Galaxy S and virtually all others. Wake up to your favorite songs with this Bluetooth-enabled Hello Kitty alarm clock! Digital FM tuner. eKids Digital FM Clock Radio. Lets you choose from a wide variety of radio, talk and music programs. 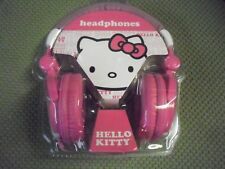 Title: Hello Kitty KT2081AT Jeweled Earbud Headphones in Pink. UPC: 077283018022. Rock out to any playlist when you connect your audio device via Bluetooth. Hello Kitty design. Pair this speaker with your smartphone, tablet or other Bluetooth-enabled device. Sorry, No Exceptions. NEW IN OPEN BOX. Bluetooth Speaker with Speaker Phone. The speaker is White. Plays audio from MP3 players, smartphones, tablets, computers, and other Bluetooth audio devices. Dynamic speaker for full range of sound. USB cable included. Hello kitty MP3 sound blasting speaker from mobi. Brand new in the box. Refer to pictures and thank you for looking. Rock out to any song,tune or playlist when you connect your smartphone or audio device via Bluetooth. (or you can use the line in USB cable that is included). Color: White. Si-B42 - White/Red. Personalize your Ear Buds with Beads, Thread & Sparkling Gemstones! 1 Hello Kitty Ear Bud Set. 5 Skeins Embroidery Thread 8.75 yd (8m) Each. 25 Sparkling Gemstones. Comfort plus earphones featuring Hello Kitty. New in package. Speaker & Headphone Set. HELLO KITTY. Headphones - Compatible with all ipad, iphone mp3/mp4 players. ~ NEW in BOX ~. Wake up and go to sleep to your favorite tunes with an alarm clock designed especially for Smartphone users! GREAT GIFT FOR A HELLO KITTY FAN! Wireless Bluetooth Pairing to any compatible Smartphone. Sanrio Hello Kitty Bluetooth Speaker System USB port Aux Input Works Great! Sanrio Hello Kitty Bluetooth Speaker System. Works Great! Condition is Used. The device uses 4 AA batteries which are not included. The speaker is compatible with iPod, iPhone, MP3/MP4 player, Portable Audio Systems. Line-in option also allows input from any headphone- output from any audio source. - plays audio from MP3 players, smartphones, tablets, computers and other bluetooth audio devices. - dynamic speaker for full range of sound. Hello Kitty Bluetooth Speaker New In Package! Rechargeable-For all mp3 players, smartphones, Tablets and computers Stream Music Wirelessly-has Headphone Jack and Charging Cable Included. Hello Kitty Kt4040 Usb-powered Water-dancing Speakers NEW! Item model number: KT4040. The USB-Powered Water Dancing Speakers from Hello Kitty play music from virtually any electronic device with a headphone jack. The multicolor, LED light show responds automatically to music being played. 4.5 out of 5 stars - Hello Kitty Kt4040 Usb-powered Water-dancing Speakers NEW! 4 product ratings4 product ratings - Hello Kitty Kt4040 Usb-powered Water-dancing Speakers NEW! Hi Fidelity Ear Buds. Compatible with all iPod/iPhone, iPad, tablets and MP3 Players. Item is working great! Getting your order fast is one of our top priorities. The 3.5mm plug is compatible with iPod, iPhone, smartphones, MP3 players, CD players and computers. Hello Kitty Earbuds with Jeweled Bow feature Kitty Cuteness! 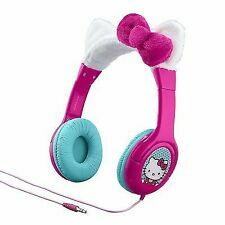 HELLO KITTY HEADPHONE OVER THE EAR DJ Style High Definition Sound. Hello Kitty print on muffs. Full range stereo headphones. Simple to follow instructions are provided below. 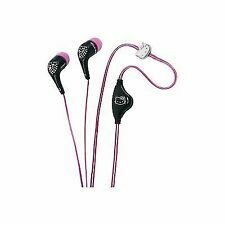 New in Pkg Pink Hello Kitty Ear Buds w/ Bonus Ear Tips Included. FREE SHIPPING! Stream music via Bluetooth® to a speaker that suits your style. The Hello Kitty® Speaker System features Bluetooth® 2.0 and a 4-watt amplified speaker, plus a 3.5mm aux input and audio cable to connect wired sources, such as a computer, CD player or digital audio player. ITEM : Earbuds and Cushions. Includes extra ear cushions. Smart phones. EU Parallel Import laws state that a trademarked item that was not originally sold into the EU cannot be subsequently sold into the EU without infringing on the trademark rights of the Rights Owner.